A cover of cloth netting protects fruit from hail and birds, and limits sun damage. 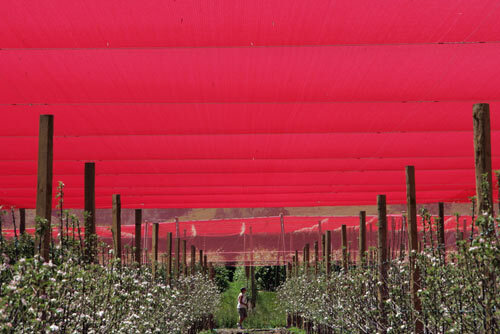 Red shade-cloth is favoured by some growers as it helps the colour of red apples to develop – but some residents of an apple-growing area near Nelson took a case to the Environment Court in 2007, arguing that the coloured cloth was visual pollution. The court disagreed.